Progressive Music sure has a different connotation than it did, say, ten years ago. As Progressive Music does, it has expanded and pushed the traditional boundaries of the genre to new and interesting heights. 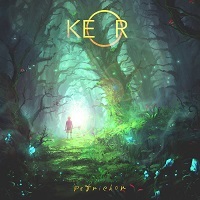 KEOR’s new album “Petrichor” is the brainchild of composer Victor Miranda-Martin, with some special guests. This is his sophomore release, following his 2016 debut entitled “Hive Mind.” Five lengthy tracks await us here. The title track, “Petrichor” leads us off, with a trippy set of guitar chords and vocals. It reminds me of the music that you might hear entering the desert, ready for a trip, in more ways than one. A warm sound ensues as the instrumentation begins to pick up a bit. It slowly gets a bit heavier, with a funky groove for a riff, and then it’s back to that trippy but alluring sound again. It waxes and wanes, again, coming back and forth between the two styles while building in layers through the end of the song, with a fantastic little guitar solo. “The Nest of Evil” opens with a jovial riff and thick keyboards. Again, that trippy sound is still fairly present. Some light piano mixes in with a stripped down guitar sound. There are several shifts along the way as well, and it’s hard to keep up with. But, when he stretches out the vocals, it’s quite lovely. Another perfect guitar solo keeps the juices flowing and it really comes full circle afterwards, in texture and layers. “Snivel by the Pond” opens with cautious keys and an ominous feeling in the background. The vocals are very dreamy…like you wandered into someone else’s trippy slumber. The clarinet notes are particularly intriguing here. Just after the five-minute mark it picks up with additional instrumentation, carrying the curious little melody to completion. “Terence” opens with birds chirping and an ominous sign of sorts in the acoustical guitar, washed away quickly with light vocals and instrumentation. This layers built here are complex but don’t mess with the melody. But just when you think all is clear that ominous tone from the beginning returns, and with a dark vengeance, and a staccato guitar attack. “Abyssal Bloom” is a fourteen minute beast, opening with lumbering bass and guitars that are dark and confrontational. The vocals temper the beating with soft and ethereal notes that calm you in the midst of the storm. At about six minutes in, it changes gear, with soft piano and vocal harmonies. It drops even further with muttering vocals and soft bells, but is revived with fervent soundscapes where it floats to completion. Overall, I found this album to be very unique. At its core, it’s Progressive Rock, but you are going to encounter a lot of elements borrowed from other genres. It’s almost as if Victor is overly familiar with all genres of music and incorporated them into his album. My only complaint is the vocal style. It was too ethereal for my tastes. I understand the juxtaposition between the music and the vocals. But it was just too airy. The music however, was fascinating. It’s a very personal look into Victor’s artistry and musical vision.